Some may be familiar with the memoir of Tim Conigrave, "Holding the Man" published in the mid 1990's, and much later formed the basis for the screen play of the film, with the same title, in 2015. It is a powerful story of life, love, sexuality, loss and Catholic identity. Peter was mentioned in this memoir by Tim Conigrave, "Holding the Man", officiating at the funeral of Tim’s partner, John Caleo. 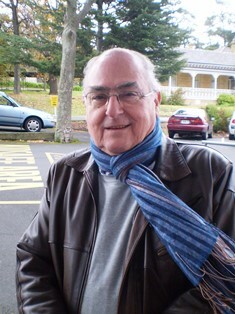 “Among all vocations, late or early, there are some who have an easy road to ordination and there are some for whom the road is bumpy, I was one of the latter,” Fr Peter Wood MSC wrote in an article for the Tasmanian Catholic, a year after beginning his ministry in the Moonah-Lutana Parish. “I was influenced by the external factor of meeting priests who combined the qualities of being both strong and gentle with leading challenging and adventurous lives. I found them admirable men. The internal factor was a desire to integrate my life so that what I believed was in harmony with what I said, did and felt, hoping that priesthood might provide that for me. I joined the Missionaries of the Sacred Heart because that was the path laid out for me,” Fr Peter wrote. “It is obvious that I have had an unusual career and followed a path with many ups and downs, and twists and turns. From one angle it looks unsettled and a bit of a mess, from another angle it has been interesting and challenging. But I am truly glad that it has been the way it has been and I am grateful for the way God has worked in me,” Fr Peter wrote. ”Fr Peter was also a valued presence in our CatholicCare Prison Chaplaincy Team. Peter attended the HM Prison in Ararat, Victoria driving across from Hamilton. For many years he visited the residents there and celebrated the Mass for them. His gentle presence was much appreciate by the men, especially when the local Parish Priest was on leave. Fr Peter was the reliable presence with the men there in HM Prison which later, after a large expansion, became known as it is today - the Hopkins Correctional Centre,” says Sr Mary O’Shannassy OAM, JP, Director of Catholic Prison Ministry Victoria.